We hope that you enjoy using our website, safe in the knowledge that we Collinson Latitude operating the Virgin Atlantic Shops Away website on behalf of Virgin Atlantic Airways (Flying Club) Ltd. are committed to protecting your privacy and security online. When you become a registered Virgin Atlantic Flying Club member and make qualifying purchases through an affiliate site via the Virgin Atlantic Shops Away website you will be entitled to Flying Club miles in accordance with our Terms & Conditions. Virgin Atlantic Shops Away will collect and store the information you provide in the registration process, including personally identifiable information such as your name, street address and e-mail address. Virgin Atlantic Shops Away uses this information only for the purposes of calculating and allocation of Flying Club miles. Shops way does not collect personally identifiable information in any other manner, only by you providing it to us in the registration process. To collect Flying Club miles from participating merchants who will be displayed on instore offers pages of the Virgin Atlantic Shops Away website, you will need to have registered valid payment card(s) to enable transaction monitoring to take place. Transaction Monitoring will determine whether you have qualified for an offer linked to your payment card(s). You may opt-out of transaction monitoring on the payment card(s) you entered at any time by clicking “Remove” against each card registered. Virgin Atlantic Shops Away does not provide your personally identifiable information to third parties for direct marketing purposes. Virgin Atlantic Shops Away may engage third party contractors who provide services to Virgin Atlantic Shops Away and who may have access to such information in connection with performing their services but none of these third parties have permission to use or disclose such information. Such information may be made available to affiliates of Virgin Atlantic Shops Away (i.e. any parent or subsidiary entities) or its agents, such as independent auditors, consultants or attorneys for internal business purposes. Your information may be disclosed if, in reasonable judgment, such disclosure is necessary to comply with law or government agency requests. If you register payment card(s) in connection with transaction monitoring, you are authorising Virgin Atlantic (via Sports Loyalty Card Limited (Reward)) to share your payment card information with Visa, MasterCard, American Express and other necessary payment service providers (Payment Service Providers) to confirm your enrolment. You authorise the Payment Service Providers to monitor transactions on your registered card(s) to identify purchases to determine whether you have qualified for an offer linked to your payment card(s), and for the Payment Service Providers to share such transaction details with Sports Loyalty Card Limited (Reward) and where applicable, Virgin Atlantic to enable your card-linked offer(s) and target offers that may be of interest to you. Please refer to your Virgin Atlantic Flying Club account. You can also reference your Virgin Atlantic Shops Away Shopping History Page. 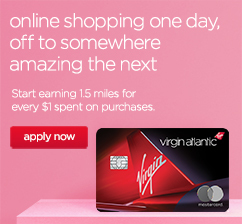 Virgin Atlantic Shops Away may receive account information from affiliates including, information regarding qualified purchases. Virgin Atlantic Shops Away discloses to third parties non-personally identifiable information that Virgin Atlantic Shops Away has obtained about your online behaviour in the aggregate for advertising and marketing purposes and to service providers to enable them to improve services. Virgin Atlantic Shops Away does not provide information regarding individual users but only aggregated data. The Virgin Atlantic Shops Away website and services may contain links to other websites and the software may redirect you to websites that are owned and operated by third parties including affiliates. Virgin Atlantic Shops Away is not responsible for the privacy or confidentiality practices or the content of such websites. We encourage you to carefully read the privacy policies of each site you visit. Where it is necessary for the allocation of your Flying Club miles, Virgin Atlantic Shops Away may disclose to participating stores information you have provided, or information that Virgin Atlantic Shops Away has obtained about your Virgin Atlantic Shops Away account or shopping behaviour. Further, Virgin Atlantic Shops Away may receive account information from participating stores including, but not limited to information regarding purchases made, products ordered, order number, as well as the time and date the purchase occurred. You agree to hold participating stores harmless for any information disclosed to Virgin Atlantic Shops Away.